The Journal feature in Outlook is often overlooked. It creates a timeline of transactions that can be linked to a contact. A transaction might be an email, task, appointment and so on. This feature provides useful records, but also a lot of data. I prefer to selectively use it for phone notes. 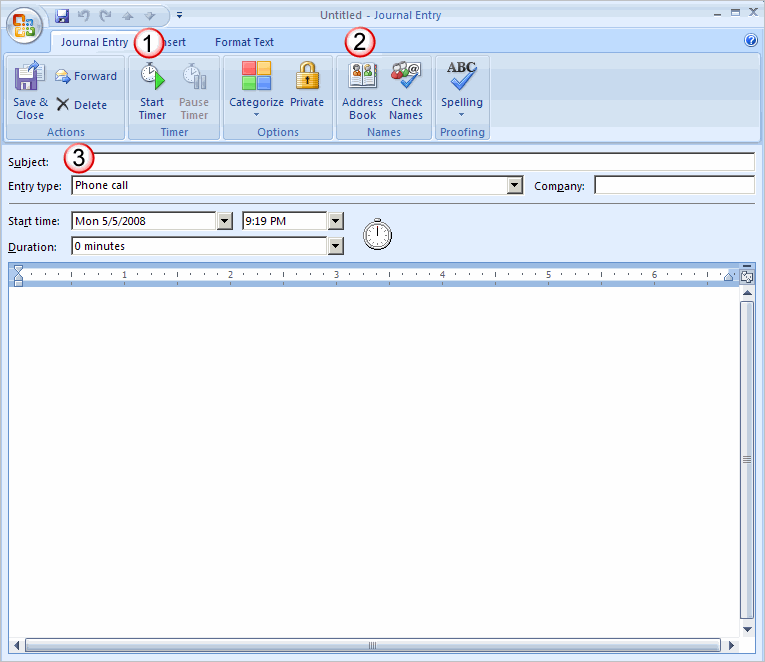 Using the Journal feature, I can create entries from a contact’s page. This is useful when I use Outlook’s Call feature. Alternatively, I can create an entry by using a keyboard shortcut and assigning the entry to the contact later. Either way, Outlook will show me the notes when I view the contact’s activities. In other words, you can use this Journal feature even if you’re not using telephony services. I prefer to use Microsoft Outlook to place the call to a contact. I have a DSL connection so the software can make the call. I pick up the handset when the display reads “LINE IN USE”. Open the contact record for the person you wish to call. 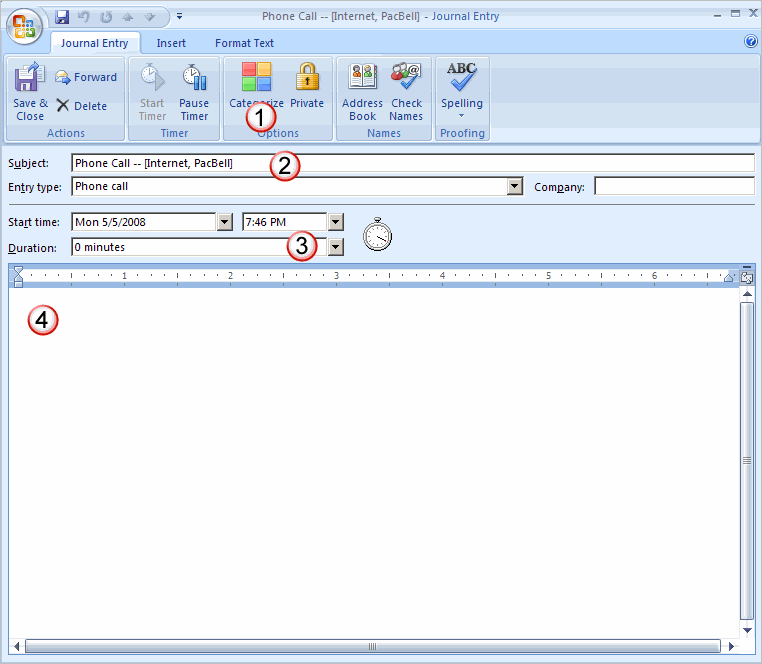 For Outlook 2007, click the Call icon on the ribbon. (Outlook 2003 users need to select Actions | Call Contact.) You should see a list of the contact’s phone numbers. Select the phone number. The New Call dialog should appear. Check the box for Create new Journal Entry when starting new call. This is the item that trigger’s the journal. Click the Start Call button. Your PC will dial the entry in the Number: textbox. The Journal Entry should open and you can type notes about the conversation. Outlook pre-fills some fields for you. For instance, the Subject: field (2) is created based on the contact record, but you can edit the information. The software also starts the timer and increments the call Duration: (3) while you’re online. You can use the lower panel (4) to type important information about the phone call. Once the call is done, click Pause Timer. You can also add optional information such as Categorize (1) to label the call. As example, I have a category for “Support”. Click Save & Close. This will close the Journal entry. Click End Call on the New Call dialog. This hangs up the phone and releases your phone line. There are times when you can’t use Outlook’s built-in Call feature. This might because of your telephony setup or someone calls you. You can get around these situations easily by using the keyboard shortcut to open a Journal entry. Click Ctrl+Shift+J. A dialog appears that is similar to the one pictured in Step 6 above. Click the Start Timer icon (1) on the ribbon. Assign a Subject: (3) for the call. Type your notes in the lower panel. Click Pause Timer when the call is done. Click the Address Book and assign the entry to a contact. You can also assign a Category. The nice thing about this system is that it makes it easy to reference items. Yesterday, my ATT rep asked me when I replaced my DSL modem. By clicking Activities on the ribbon, I had a nice view of my support history. I simply filtered the Show: field to just list Journal entries. As with all Outlook views, you can add columns to suit your needs. This shortcut method also allows you to add entries after the fact. There have been times when someone has called and the PC is off. I’ll write the pertinent notes on a pad and then transfer them to Outlook soon after. You can also use the same procedure for adding other types of entries such as a document. This system doesn’t guarantee me perfect support, but it’s been very useful on follow up calls. I’ve encountered too many companies that have gone through mergers and lost customer records. I wish I had started doing this procedure sooner. This is just one way to use Outlook’s Journal feature.